We have leased our own Outstation dock in Silva Bay, at the Silva Bay Resort and Marina, D Dock, Slip S48. This dock is 80 ft long, providing (depending on length) room for 2 vessels alongside. There is potential for rafting, members mooring alongside should be cooperative. 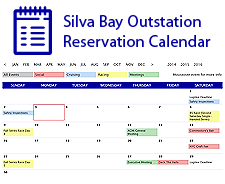 Members can reserve moorage to a total of 80 ft./day on our ONLINE Silva Bay Outstation Reservation Calendar. Without a reservation moorage is 1st come/1st served. 2 nights maximum stay, unless dock is vacant. Sign-in required in the yellow Club Check-In box on dock and at Marina Office. Members are responsible for their own power costs, payable in the office. Click the Silva Bay Dock Plan graphic at right to view their dock plan in printable PDF format. Update October 5th, 2017: We have received notice that the Silva Bay Pub/Restaurant has had a fire which mostly destroyed their restaurant/pub. You should check their website or call them (250-247-8662) to confirm which ammenities are in place if it will effect your stay there. Were you looking for our Reciprocal Club destinations?